On Saturday, January 14, 2017, Ray passed away peacefully at home with his wife and best friend, Beth, by his side. Ray was the son of Raymond and Kathryn Zell and grew up in Cheyenne, Wyoming. He went to high school in Cheyenne and later graduated from the University of Wyoming in 1955. 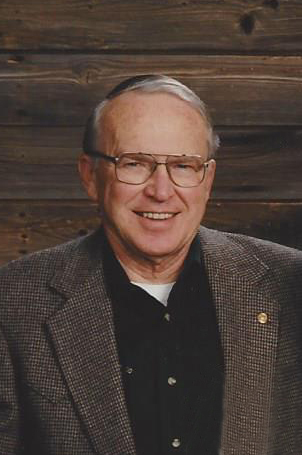 After serving in the U.S. Navy as an Oceanographer, and working for a while in Calgary, Ray returned to the University of Wyoming and graduated with a Master of Science in Geology in 1959. Ray started his career as a Geologist in Calgary with Amerada and later opened the Calgary Exploration Division of Inter-City Gas Limited as Corporate Vice-President, finishing his career as an Exploration Consultant upon retiring in 2001 and loved his work as a Geologist. He was a life-long member of AAPG, CSPG, and APEGA. He was always a cowboy at heart and for many years raised Murray Grey cattle and horses. He volunteered for many years as a Director at the Calgary Zoo, the Calgary Stampede Rodeo committee, and as a Timer for both the afternoon rodeo and the chuck wagon races for 32 years. He coached minor hockey for many years and was a member of The Olympic Organizing Committee, and a Timer for the hockey games at the 1988 Winter Olympics. Ray also volunteered as a Treasurer for the Cochrane and District Chamber of Commerce, and was a founding member of the Cochrane and District Community Foundation. He very much enjoyed volunteering with helping to organize the Hooves of History 2000 Cattle Drive, as well as other volunteer activities. Ray loved to hike, bike, and cross country ski in the Rocky Mountains and he enjoyed his time in the garden, especially growing flowers with Beth. He is survived by his wife, Beth; his brother Jim (Marie) Zell and son Brian of Cheyenne, Wyoming; his son Tyler Zell of Calgary; his nephew Brad (Ty’lene) Jackson and children Taylie, Alston and Kinlie of Laramie, Wyoming; his niece Gayle (Steve) Dilling and children Morgan and Olivia of Port Orchard, Washington; his father-in-law Arlie Ganong; his brother-in-law David (Holly) Ganong of Kingston, N.B. and their children Ben (Christina) Ganong and children Nathan and Noah of Norton, N.B., and Adam (Audrey) Ganong of McDonough, Georgia; his sister-in-law Deborah (Oran) Perrin of Canmore, AB and their children Dennis (Jocelyn) Perrin and children Jesse, Amelie, and Thea of Spruce Grove, AB, and Anthony Perrin of Oromocto, N.B; his brother-in-law Tim Ganong of Hampton, N.B; as well as many dear friends in Cochrane, Calgary, Cheyenne, and many states in the U.S.A. He is also survived by his much loved “Westies”, Buzzy and Meg, who brought him many laughs and happy times. Ray is predeceased by his mother and father, his sister Maggie and her husband Gregg Jackson, and his brother John Zell. At Ray’s request there will be no funeral service and cremation has taken place. Heartfelt thanks to Dr. John Heine, Dr. Lynn Lambert, Dr. Jan McPhee, Dr. John Nesbitt, Lisa Kroeker R.N., and all of Cochrane Home Care team, Community Paramedics, and Palliative Care team for their wonderful care of Ray and a very special thank you to Ian, Kelly, Reid, and the Staff of Grand Avenue Pharmacy, Cochrane for all of their extra help the past few months. Donations may be made in Ray’s memory to the Cochrane and District Community Foundation, Cochrane Humane Society, Canadian Cancer Society, or the Canadian Diabetes Association. Dear Beth, I was so sorry to hear about your loss. Please accept my heartfelt condolences. Ray was a wonderful man and friend. You are in my thoughts and prayers as you walk this new journey. Lots of hugs Annemarie Fairman. Sincere condolences on the passing of Ray. I had the pleasure of serving with Ry the Cochranecountryfuneralhome Foundtion. He was a fine person who did a great deal for his community. Beth, thank you so much for sending us your letter and attached obituary. I just received it today, from being forwarded from our previous home. It brought us all great sorrow to hear of his passing…but peace that he is in a great place today. That great place is surely to be hiking or skiing in the most pristine of conditions and beauty, or timing and helping out at what will be the most spectacular rodeo to be witnessed. I have only very fond memories of Uncle Ray, and it still brings a smile to my face when we were all together during CFD (rodeos and parades – he seemed to know everyone from his days in Wyoming), at Holliday park in Cheyenne having lunch with the whole Zell family, or getting to watch Tyler play hockey at McNichols Arena in Denver (I must have been 8 or so at that time). He gave me my first hockey jersey…a CCM Calgary Flames jersey, that my own son Alston was able to use as a practice jersey when just a Bantam. He was warm, kind, soft spoken, and always had a smile on his face. Beth, thank you for taking care of my Uncle Ray, and thank you for always being there for him. I always knew in my heart that he was in good hands, no matter how long things went silent. All of our best, Love, The Jacksons.